Phonebook or contact information is the most important part of every mobile user. Most of us have forgotten to keep a written backup of mobile numbers and when we do not have our mobile along, we are helpless. This is also true when you want to change mobile phone or want to transfer complete mobile contact information or phone book. You need to export all your contacts to a VCF format file. All type of phones can export the contact to a VCF file. VCF stands for Visiting Card File. When you share contact information through text message or via instant messaging service like WhatsApp the file is exported in VCF format. Most of the mobiles do have an option to backup your mobile phonebook but they all save the backup file in a proprietary format. Eg. Nokia saves a backup file in .nbf format. You can use that backup file only for other Nokia mobile. (Read How to extract and Read Nokia Backup File like .nbf and .noki) But if you have changed the handset manufacturer this phonebook backup does not come to your help and you have to transfer all these addresses manually. The other way is to save all your phone-book as a vcf file. All the phones have this feature but the problem is each and every entry is saved as a separate file. So if you have to say 500 contacts, there will be 500 .vcf files. This is the most commonly used contact format. It's called "Visiting Card File/format". You will find this type of contact files when you try to back up your entire contacts from your mobile to the memory card. Your mobile will save every contact in one .vcf file. If you want to transfer all your contact from mobile to any other software you have to manually transfer each and every file. So What is the solution to transfer all these contacts at once? CSV is the most commonly used data management format. Its Comma Separated Value file. You can use simple office excel to edit the file. Once you have converted the VCF into CSV, you can Edit the converted.CSV file as you want with this "CSVEd" software which is Free or you can also use MS Excel to do this. If you do not like the CSVEd, you can use more easily and excellent utility which is just 100KB. Download CSV File View here. Did you find this article useful, let me know. Please reply or comment. Thank you for the instruction. After the conversion, the .csv file recognised the phone numbers as numbers and omitted all the + signs for the country code. Anyway that can be corrected without having to enter the + sign? Yes, you can remove plus sign. You can also set the bulk rule to add + sign in all phone numbers with the CSV edit software. You mean, you want to send a contact file to your friend? You can easily send even a single contact or a whole phonebook containing 1000's of contacts. Just tell me, what type of contact file you want to send? Do you want to send complete phonebook of your mobile? If you want to send a complete mobile address book, tell me which mobile model you have and where or by what means you want to send it to your friend like via email or via a shared file. mai tumhari poori help karunga. par tum mujhe details batao. there are many such tools. just give details. i'm just a step away from success using your method, please help me converting my 984 VCF files to CVS, as i followed your method all_in_one.vcf and imported it into outlook, it just imported one contact detail and without name, i want to import all my vcf to outlook but not one by one.. so need your kind help..
Hi Pritpal, you are welcome. What a pitty that I didn't find this page before few hours ago. You save my nerves and my keyboard too. Awesome. Thank you, thank you thank you. I forgot how easy everything was before ! @#$%^&* Windows. I spent an hour trying to download a tool from a web site to do my christmas mail merge and gave up right before finding your post. Thanks for the simple solution. Did I say thanks? Well, thank you. having one major problem with the conversion of multiple vcf into one..
can u tell how to discombine combine VcF Files in seperate vcf files??? Thanks a lot. Great tip. Saved me a lot of headache in importing so mny vcf's into my new phone! I JUST COPY N PASTE YOUR CMD N GOT WORK DONE! hello sir am having lumia 620so i want to upload my .vcf contacts into it. as i hav done ur mentioned process of "all_in_one.vcf" and now am not able to do any further steps iam uploading via hotmail and it needs .csv file one by one. so please help me in uploading my contacts or converting it in to .csv file. 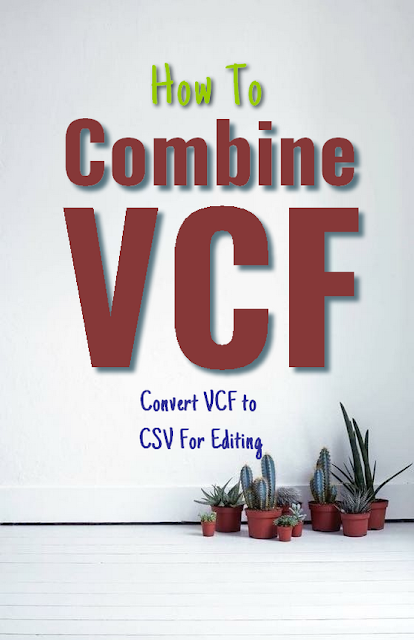 Hi Vivek, actually, the tutorial already discussed the way to convert VCF file in to .CSV file. You can also use the csv edit application software to do it. hello sir as am using lumia 620 it imports contacts through hotmail which is .csv file supporter. i have done ur above mentioned step"all_in_one.vcf" now how i convert this into .csv file. while iam doing through hotmail mail it is taking one by one file. so please help me out in uploading my contacts or converting them in bulk in .csv file. Hello, at the beginning I had the many VCFs contact files (about 300). So, I used the command "copy /B *.vcf all_in_one.vcf" described above. Then I imported this all_in_one.vcf into the Google account as a new contacts. Then you have to export them to Outlook CSV format file - all_in_one.csv. And finally, you need to import it to your LIVE account. So, at the end you will have all these contacts imported in your actual live.com account. You can synchronized them in your Nokia Lumia phone. Hi Enigmatique, thanks for the easier way and your help. Only half of my contacts out of 800 are converted into single vcf. What to do about the rest?? Only about half of my contacts out of 800 were converted to single vcf. What about the rest? Very useful article.thanks for the help. Every website I went to told me to do the Command Prompt thing and stopped there. However, Google only grabbed the first contact of the entire compiled file. Tried compiling it by typing ".csv" instead of ".vcf" but that didn't garner good results. The online converter is a life saver! actually , I don't know how i can thank you well . i was lose between sites about this issue , you are the only one who helped me .